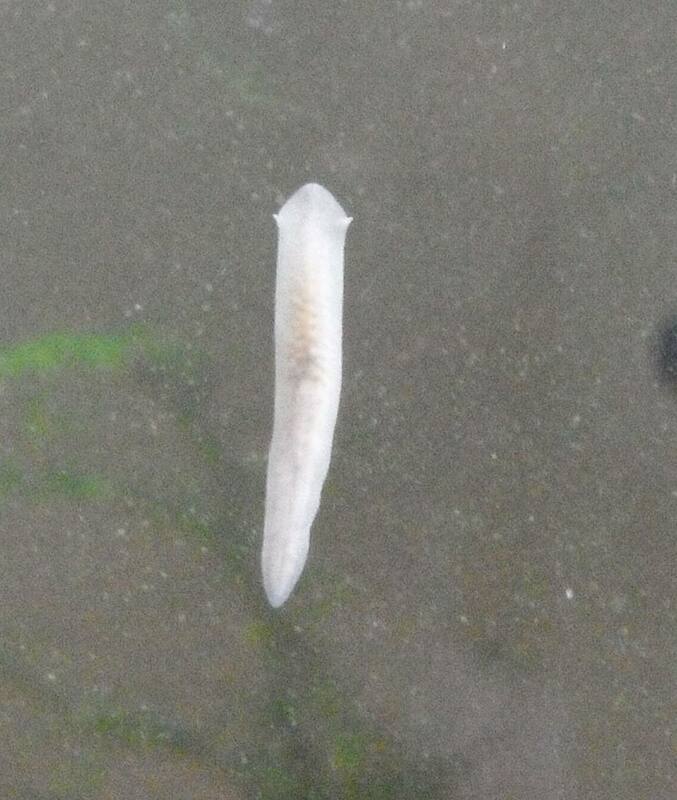 What Are These Tiny White Worms in My Fish Tank? If you have noticed tiny white worms in your fish tank, you likely have one of two issues that you need to deal with. The good news is that the more common one, Detritus Worms, are naturally found in many aquariums, and an infestation can be fixed with proper maintenance. In the worse case scenario, you may be dealing with Planaria, but this is nowhere near as common. These flatworms are most often brought in with pond plants, so if you've introduced those recently then noticed white worms, that may be the problem and chemical treatment is required. However, before you do anything to your tank, you need to be positive about which white worm you're dealing with. Only then can you know if a good cleaning or the careful use of a de-wormer is required. There is a lot of misinformation about this issue online, and you want to avoid harming or killing your fish by making the wrong move. Detritus Worms are annelids, a phylum that includes segmented worms such as earthworms and leeches. They look like thin, white-brown strings that wiggle through the water. Detritus Worms are detritivores, meaning that they eat decomposing plant and animal material. They will not harm your fish. It is not uncommon for an aquarium to have Detritus Worms, as they are introduced through a variety of means. For instance, they may have come in with a new fish or plant, and may even have been present in the gravel if you moved it from another tank. Quite often, Detritus Worms are not noticed. They tend to live in the gravel where they eat all the debris left over from feeding and deposited by your fish. Normally, you may only notice them when they get sucked into the tank vacuum. They are also typically not a problem and may actually be beneficial because they're helping keep your tank clean. How Can You Take Care of Detritus Worms? The problem occurs when you see a lot of Detritus Worms out of the gravel. This can be shocking because your normally clean water may be filled with hundreds, if not thousands, of tiny white worms, and you don't know what caused it. Typically, this abundance of worms occurs when they become overpopulated, which can cause the water to become low on oxygen. If you're not cleaning regularly or overfeeding your fish, they can reproduce rapidly and get out of control. Reduced oxygen is most often caused by a dirty aquarium, poor filtration, or having too many fish. Any of these can cause cloudy water or lower the pH of the water, and this is when the Detritus Worm will try to get to the top, looking for more oxygen. The solution is to begin by giving your tank a thorough cleaning. Use a gravel vacuum and change the water to remove the majority of the Detritus Worms and their food sources. You can keep it under control by regularly cleaning the substrate and reviewing your feeding practice. You want to ensure your fish are getting enough of the proper food without creating too much waste. Secondly, be sure to check your filtration system for any issues. A proper oxygen level is required, so a well-maintained filtering system is essential to a healthy tank. Then, make sure that you haven't overextended the number of fish living in your tank. This is another key to controlling oxygen and waste levels. If needed, you may have to find a new tank or home for some of your fish to maintain a proper balance. It's important that you do not treat a Detritus Worm issue with de-wormers or any medications. It will not take care of the problem and may cause a fish kill. Planaria (singular, planarium) are flatworms in the class Turbellaria. They are related to flukes and tapeworms but are not related to Detritus Worms (which are not "flat" worms). They are quite small, but if you can examine them close enough, you'll see eyespots as well as protrusions from the sides of their heads. Quite often, these are the worms that are crawling on the glass of an aquarium. Planaria are found in fresh and saltwater all over the world. It is an asexual animal, meaning it can reproduce on its own. Even cutting one into pieces thinking it will die doesn't help. That's one way that they regenerate and reproduce, so you'll have a new worm for each piece. Since they are very common in the world, it's possible that you introduced Planaria to your tank with a recent plant. This is especially true if you acquired it from a pond or natural water source. These worms are scavengers and carnivores. Although they will not harm your healthy fish, they love to feast on eggs and therefore are dangerous if you're breeding egglaying fish. They may also prey on weaker fish. How Can You Get Rid of Planaria? If you do indeed have a Planaria problem, then it's a serious issue. Remember, first, that Detritus Worms are far more common and number in the thousands. Planaria will often be just a few flatworms. This is important because getting rid of Planaria requires chemical treatments that may harm your fish population. You want to be absolutely sure that it is Planaria before seeking the solution. Thoroughly research each of these products before using them to determine if they're good for your aquarium and safe for your fish. In general, vulnerable animals like snails, shrimp, and silverfish should definitely be removed. Sharks, lionfish, piranhas, bottom feeders, and certain scaleless or Metynnis fish may also be sensitive to some treatments. Also, be sure to use the recommended dosage from the manufacturer. Too much can cause a fish kill, which is the last thing you want. AAP Clout Parasite Treatment or any product containing Trichlorfon seem to be the most effective. API General Cure may be less effective, but is a decent alternative to Clout. Levamisol HCI is a general de-wormer, though it should be used with caution and may not be as effective as the other options. Each of these products can be found at American Aquarium Products & Supply, which also has great information about their safe use.